Update your everyday look with the Grace Hill Knot Tee in floral or coral print. 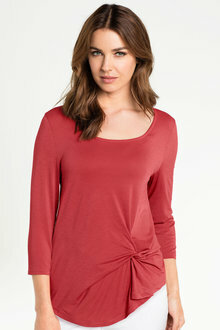 Featuring a scoop neck, 3/4 length sleeves and a curved front hem with knot detail. keep your look casual by pairing this tee with denim and boots or dress it up with the Grace hill Knit Maxi Skirt, they're a prefect match. Measures 62cms from front shoulder to hem.